Morning shot of Chandra Taal from Phantom 4 Professional Drone. 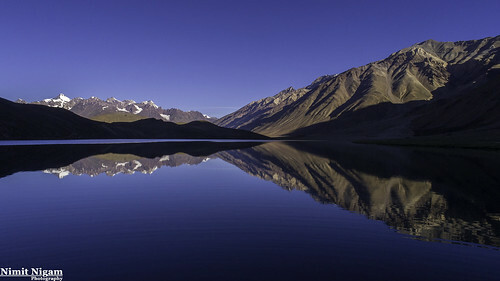 Chandra Taal (meaning the Lake of the Moon), or Chandra Tal is situated in the Spiti part of the Lahul and Spiti district of Himachal Pradesh (India). The name of the lake originates from its crescent shape. It is situated at an altitude of about 4,300 metres (14,100 ft) in the Himalayas.